Healthy lifestyles are easy to follow when you are at home. You are in control of all the ingredients when you are cooking. You know exactly how many teaspoons of butter you put on your sweet potato. But we live in a real world where we need to know how to eat healthy even when we are not at home. The good news is that it can be easier than you think! Restaurants will add lots of fat to their meals to make the seem more tasty. Most restaurants have plain meat options like steak, chicken, or salmon. Start your plan by picking one of these low carb main dishes. Filling up on protein will help you stay full longer too! Make sure you let your waiter know that you won’t be needed the white flour bread on your table (or tortilla chips). These temptations are best to avoid. You can enjoy low glycemic options like sourdough and rye breads in moderation, but most restaurants won’t always have those breads to offer. If you are tempted by bread baskets and have trouble resisting, choose a restaurant that doesn’t offer a bread basket. If you already know you eating out, go to the restaurants website and look at their menu. You can plan ahead and not get frustrated by time pressure from your waiter or other guest. This will help you choose the best meal and make the evening more enjoyable. If you are unable to find a menu item that isn’t on plan, give yourself grace and just pick the best option. Italian: Main dishes with no pasta (they are available!) with low carb vegetables and salads. At Olive Garden, you can ask to sub the pasta for extra broccoli. We also love eating at Ruby Tuesdays that offers a huge salad bar with their menu items. They also serve some unique low carb sides like spaghetti squash. We like to add Parmesan cheese from the salad bar and extra butter and salt. Don’t think that you are stuck eating at home eating low carb! 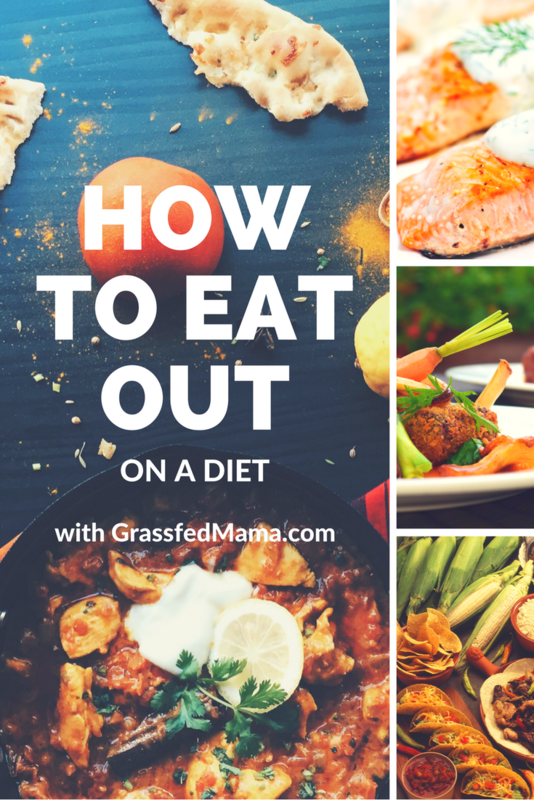 There are lots of options to help you lose weight and enjoy the pleasure of eating out. What are your eating out tips while trying to eat low carb? Leave me a comment! -Red Robin restaurants offer any of their sandwiches and burgers with a lettuce “bun”. They also offer side salad and steamed broccoli as options instead of fries. I read, recently, that these options are also available as “bottomless” just like the fries. -I have asked at other restaurants if they have an option other than a bun for a burger. Almost any time, it can be served without one and there are many who will wrap it in lettuce. Backyard Burger is one of these. -Be bold and ask what options they offer to replace carb-laden items. How awesome! Thanks for the tip. I love how simple it is to stay “on plan.” Seriously, I eat brownies for breakfast and then can go out to dinner the same night with my hubby, and know I’ve lost weight that day. *I love THM! * Thanks for linking this at Nomday Monday. Thanks Jaime! Are you going out for Valentine’s Day or cooking this year? I will be on the road for over a week. So far, Chipotle salad bowl, Panera Chicken Greek salad (I only used a little of their dressing and added a good amount of my own ACV… went to Chic-fil-A got grilled chicken breasts put them on my own Josephs Pita and added my own mustard, Out back asked for Ceasar salad with grilled salmon, no croutons, no ceasar dressing just brought me Oil& Vinegar (tasted a drop of oil, did not taste like Olive Oil so I just poured on the vinegar … wishing I had my own ACV). They were very adaptable, will see how the rest of the week goes. We even stopped at Hardees and they wrapped burgers in lettuce leaves! Love this program! Thank you for this article, good advice! I will make sure to ask about low carb options for fries. Yes! I love THM so easy to follow even on the road.